It will propose implementation of Canada's first-ever official poverty line. File photo of Families, Children and Social Development Jean-Yves Duclos. OTTAWA — The federal government will introduce its Poverty Reduction Act next week, bringing forward new legislation to implement Canada's first-ever official poverty line, HuffPost Canada has learned. Minister of Families, Children and Social Development Jean-Yves Duclos said in an interview Thursday that having an official measure and target in place will force the government to be accountable for its poverty reduction goals. "Future federal governments will need to live up to that unless they change the law, which is of course always possible. But I'm certainly not going to do that myself," he told "Follow-Up" podcast host Althia Raj. Without an official statistic, the government relied on multiple measures to quantify what constitutes poverty, such as Statistics Canada's "low-income cut off." That's the income threshold at which a family will likely spend 20 per cent more than than the average on the necessities of life, such as shelter, food, and clothing. If the legislation passes, Canada's official poverty line, formerly named the market basket measure, will become the standard, adjusted to the cost of living in 50 communities across the country. It's a benchmark that's intended to be used to measure the government's target to reduce the poverty rate by 20 per cent by 2020; and 50 per cent by 2030. The Poverty Reduction Act would also make the Liberals' poverty reduction targets law. "And if we succeed in doing that, we also align with the United Nations' first sustainable development goal, which is to reduce poverty by half in our country," he said. It's been more than two months since the federal government announced its much-anticipated poverty reduction strategy in August. Named "Opportunity For All," the strategy rolls out $22 billion in investments the government had previously committed to since 2015. Those investments include the Canada Child Benefit, Guaranteed Income Supplement increases, War Veterans Allowance, changes to the Canada Workers Benefit, and other initiatives. Critics have challenged the government's math, particularly around the prime minister's message that the Canada Child Benefit lifted 300,000 children from poverty in one year. Some grassroots anti-poverty organizations panned the government's anti-poverty plan for being lacklustre and devoid of ambition. 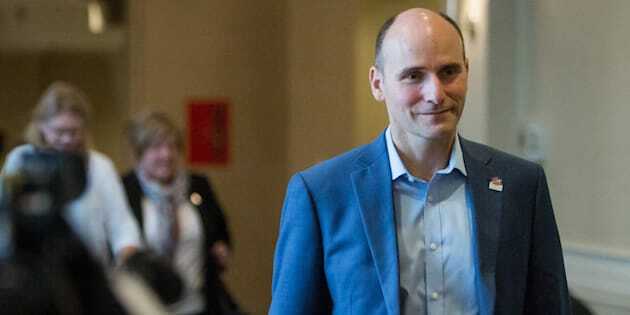 Despite the strategy being void of new program or funding announcements, Duclos maintains the government is on track to lift 650,000 Canadians out of poverty by 2019. It's "unfair" for Canadians to have an "unfortunate chance of not thriving and being well in our society," the minister explained. "So it's important to have these longer term objectives. Pallets of food are shown at the Welcome Hall Mission food bank in Montreal on March 14, 2017. The Liberals won't be the first to table a "Poverty Reduction Act" in the House in the current Parliament. In February 2016, NDP MP Brigitte Sansoucy sponsored a private member's bill that proposed the "development and implementation of a national strategy to reduce poverty in Canada and the appointment of an independent poverty reduction commissioner." Sansoucy's Bill C-245, dubbed the "Poverty Reduction Act," picked up support from Green Party Leader Elizabeth May and nine Bloc Québécois MPs. It was defeated at second reading after Prime Minister Justin Trudeau, 155 Liberals, and 82 Conservative MPs voted against it.